VR Zone published pictures of Gigabyte's G1.Sniper M3, an upcoming mATX edition that shares some of the features of the G1.Sniper 3. You can check it out over here. The G1.Sniper M3 starts off with a pair of x16 PCI Express 3.0 slots, albeit both slots would as usual operate in dual x8 mode when used with a pair of graphics cards. 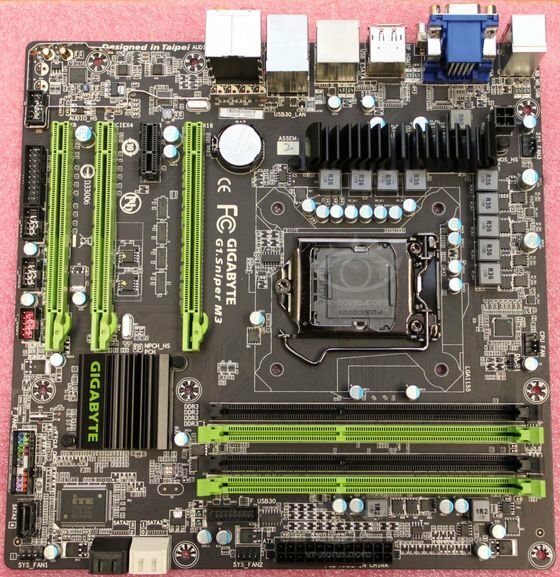 The board also has a x16 PCI Express 2.0 slot, although it only has four lanes connected via the chipset, as well as a x1 PCI Express 2.0 slot. You only get two SATA 6Gbps and three SATA 3Gbps ports, but most mATX chassis don't have space for much more than five drives anyhow, so this shouldn't prove to be an issue for most..